A letter sent on April 16, 2019 by the Bangladesh Ban Asbestos Network to the Minister of the Environment, Forest and Climate Change, other Ministers, Department Heads and diplomats has called on the Bangladesh Government to support the listing of chrysotile (white) asbestos on Annex III of the United Nations’ Rotterdam Convention at the upcoming 9th Conference of the Parries in Geneva; the discussions on chrysotile are expected to take place on May 7-10, 2019. Bangladesh imports of chrysotile have risen in recent years from 14,620 tonnes in 2015 to 22,180t in 2018. The Government is urged “to take action against this killing fibre at national and international levels…” See: Letter from Bangladesh Ban Asbestos Network. Greenpeace Colombia has issued a press release calling on the Government of Colombia to act urgently on banning asbestos and enact the “Ana Cecilia Niño” asbestos prohibitions before June 2019 when the draft legislation expires. Speaking on behalf of Greenpeace Colombia Silvia Gómez said: “the positive experiences of almost a hundred countries around the world show that the prohibition and replacement of asbestos is possible. The economic and labor consequences do not justify the use of a toxic substance that harms the health of Colombians. The social and scientific evidence is on the side of the prohibition of asbestos.” See: Greenpeace insiste en que Congreso prohíba el asbestos [Greenpeace insists that Congress prohibit asbestos]. According to a report from the Regional Epidemiology Service, the incidence of mesothelioma in the port city of Cartagena is 7.5 times higher than that in Murcia. In the last 20 years, 193 people in Cartagena have died from mesothelioma, the signature cancer linked to asbestos exposure. It is believed that much of the hazardous exposure took place at the shipyards where thousands of workers were routinely exposed to asbestos. The report stated that most workers were exposed to chrysotile (white) asbestos and that “up to 90% of pleural mesotheliomas and 50% of peritoneal tumors…” were caused by such exposures. See: Un cáncer vinculado con el amianto se ha cobrado 193 vidas en dos décadas [A cancer linked to asbestos has claimed 193 lives in two decades]. On April 12, 2019, Public Prosecutors Giuliana Giuliano and Anna Frasca began a trial at the Court of Assizes of Naples in which a Swiss billionaire – Stephan Schmidheiny – faced murder charges over eight asbestos cancer deaths which occurred between 2000 and 2009 due to workplace exposures at Eternit factories in southern Italy. A similar trial in Turin against the same defendant charged with two asbestos deaths is about to conclude; a verdict is expected soon. See: Eternit, l’amianto killer a Bagnoli: comincerà domani il processo al magnate svizzero, accusato di 8 decessi [Eternit, the asbestos killer in Bagnoli: the trial of the Swiss magnate will start tomorrow, accused of 8 deaths]. As if the struggle for asbestos compensation in Switzerland is not hard enough, victims have now been informed that CAOVA – an organization which has battled for decades to support the injured – is scheduled for closure due to lack of funds. Unlike in France, where some progress has been made in streamlining compensation procedures, in Switzerland the burden of proof for those, other than mesothelioma claimants, can be virtually insurmountable, as demands are made for documentation and details relating to exposures which took place decades ago. See: Le rude combat pour l'indemnisation des malades de l'amiante [The tough fight for the compensation of asbestos patients]. Medical experts have warned that there is substantial under-diagnosis in Spain of asbestos-related cancers and that those which are identified are just “the tip of the iceberg.” According to Dr. Josep Tarrés: “There are studies that say that between 8% and 12% of lung carcinomas are due to exposure to asbestos without the intervention of tobacco.” Occupationally contracted asbestos-related diseases recognized in Spain include: mesothelioma, tumors of the larynx, ovary, testes and oesophagus. See: Los neumólogos alertan de los pocos diagnósticos de cáncer por Amianto [Pneumologists warn of the few diagnoses of cancer by asbestos]. A peer-reviewed commentary in the inaugural issue of the Journal of Scientific Practice and Integrity examined measures adopted by asbestos stakeholders to delay action on a known carcinogen and cited the work of the Asbestos Institute (Canada) and the International Chrysotile Association, the research of David Bernstein and the failure of publications such as the European Respiratory Journal to refuse submissions from authors with ties to asbestos interests. Extracts from Bernstein’s emails and examples of payments made by asbestos defendants contained in Appendix A are informative. See: Asbestos and insurance interests continue to use discredited scientific argument to sell asbestos and to deny justice to asbestos victims. Representatives of the Fiom CGIL trade union submitted a complaint to Italy’s Ministry of Environment about the presence of 3,750 tons of asbestos – 95% of which is friable – at the Taranto steel plant, Europe’s largest producer of steel. Fiom is calling on the authorities to speed up plans for remediation which, according to a schedule of works, is not expected to be achieved until 2023. The Union claims not to have received any plans for an asbestos removal program for the plant from the company which owns the site in southern Italy. See: “Nell'ex Ilva di Taranto 3.750 tonnellate di Amianto”: denuncia Fiom al ministero dell'Ambiente [“In the former Taranto Ilva 3,750 tons of asbestos”: Fiom complaint to the Ministry of Environment]. The Russian Government, which banned tea imports after Sri Lanka announced plans to prohibit the import of asbestos roofing materials from Russia as of January 1, 2018, has now signed a Memorandum of Understanding with the Sri Lanka Ministry of Health in Colombo which explains that future Russian asbestos exports to the country will be “non-hazardous.” Sri Lanka is the world’s largest importer of Russian asbestos sheets. See: Россия будет производить неопасный асбест для Шри-Ланки [Russia will produce non-hazardous asbestos for Sri Lanka]. A judgment was handed down in the High Court in London on April 10 (see: Dr Robin Rudd v (1) John Bridle and (2) J&S Bridle Limited) in a case brought by Dr Robin Rudd – one of the UK’s leading medical experts on asbestos-related diseases – against John Bridle, pro-asbestos advocate and former asbestos businessman, who the judge said was “dishonest and obstructive throughout the proceedings.” In 2014, Bridle had lodged a complaint – later dismissed – against Dr Rudd with the General Medical Council “alleging that Dr Rudd had falsified the risks to health associated with chrysotile asbestos in expert reports.” Bridle has been ordered to provide all personal data relating to Dr Rudd and disclose the names of the recipients of the data. See: Landmark Judgment on Data Protection Act 1998. A commentary on a book entitled Eternity – A Social Construction of Banning Asbestos in Brazil highlighted the importance of the work of asbestos victims in achieving a landmark 2017 decision by the Supreme Court which declared the commercialization of asbestos unconstitutional in Brazil. The book’s author pointed out that ample evidence about the hazards posed by exposures to asbestos had been amassed years before the Brazilian asbestos sector became established. The Association of the Asbestos-Exposed, founded in 1995, represented the voice of the victims and condemned the industry and demanded recognition, medical treatment and compensation. 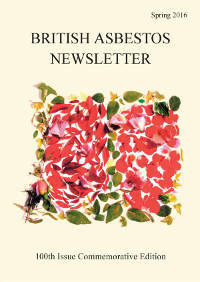 See: The Strength of Social Movement in Banning of Asbestos in Brazil. An article and video on the ILO website by Annie Thebaud-Mony, Honorary Research Director of the French National Institute of Health and Medical Research (Inserm), calls for global remedies for the asbestos epidemic which is killing thousands of people around the world every year. Eighty percent of all asbestos produced was mined after 1960 when the hazards associated with asbestos exposures were known. The author calls for trade prohibitions to be implemented and for medical programs to be established not only for asbestos-exposed workers but for family members who may have been exposed to toxic dust brought home on work clothes. See: Asbestos: limitless, endless contamination – with complete impunity. The five academic papers written in English which are contained in a 31-page monographic section of the current issue of the Annali dell'Istituto Superiore di Sanità [Annals of the Higher Institute of Health] – an Italian peer-reviewed scientific journal about public health – cover a range of asbestos-related topics including: the integration of epidemiological and social sciences research in the study of communities affected by asbestos exposure, communication and health education in at-risk communities in Italy, and narrating and remembering the experiences of affected communities in Italy. See: Annali dell'Istituto Superiore di Sanità, Vol 55, No 1 (2019). On April 8, 2019 – the day of a partial strike by workers on the Barcelona Metro – the CCOO (Spain’s largest trade union) announced at a Barcelona press conference that ~37% of the 802 Barcelona Metro workers who had been medically examined had been diagnosed with asbestos-related diseases or conditions, including 22 with diseases of the larynx, 22 with pleural cancers and 249 with other pathologies. In Madrid, three Madrid Metro workers have died of asbestos-related cancers and two more have been diagnosed. See: Un 37% de trabajadores del metro de Barcelona examinados tienen afectaciones por Amianto [37% of Barcelona metro workers examined have asbestos damage]. The plight of asbestos-injured workers in Italy and Canada were examined at a meeting on April 8, 2019 in the Canadian town of Peterborough where generations of workers from the plant run by General Electric had routinely been exposed to asbestos. The six Italian delegates were veteran trade union and medical campaigners and an 18 year old student activist from the town of Casale Monferrato, the location of Italy’s largest asbestos-cement factory; they presented information about asbestos medical innovations, community projects, and educational and environmental programs which had been pioneered in their town. See: City hosts delegation from Italian city rocked by asbestos. A commentary on the landmark decision handed down by the Supreme Court in France last week explains how the ruling might open the door to compensation claims from people exposed to carcinogens other than asbestos. The April 5 judgment widened access to compensation for “anxiety injury” to individuals negligently exposed to asbestos at all companies, not just those on a government list. In a similar way, people who have been occupationally exposed to heavy metals, ionizing radiation, diesel, used oils and greases may consider bringing claims. See: Après l'amiante, des salariés exposés à d'autres substances cancérogènes pourraient être indemnisés [After asbestos employees exposed to other carcinogenic substances could be compensated]. This Media Release by a number of labor federations and civil society associations has been uploaded to the IBAS website with the permission of its authors. Press Release: STOP - You’re Killing Us! Global Action – Clickable images linked to current developments. There are two sets of images; if one set is currently displayed, clicking "Global Action" on the dropdown menu brings up the other set. The items listed include IBAS publications, IBAS texts published by third parties and IJOEH special issues guest edited by Laurie Kazan-Allen. There are abstracts for most articles on the site dated after April 2007; the inclusion of news items commenced in June 2009. Both archives can be searched by country, geographical region or year. Stephan Schmidheiny: Saint or Sinner? Fear in a Handful of Dust! The Delegation, a group of Asian asbestos victim representatives and supporters, journeyed to Quebec in order to persuade the Government of Quebec to withdraw backing for the development of a new asbestos mine and to request that Canada cease the export of asbestos fiber  in particular to their home countries  unilaterally. 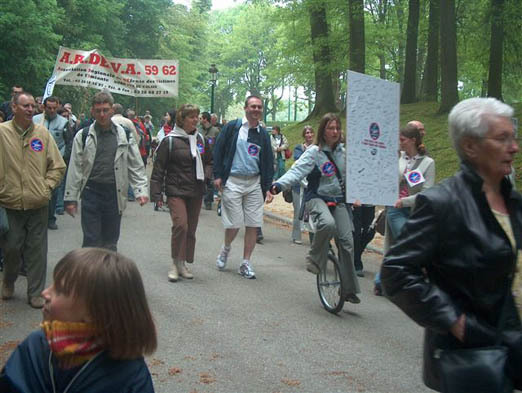 Under cloudy skies, members of Belgian and French Asbestos Victims' Associations from Dunkirk and Bourgogne marched side-by-side in the third annual demonstration organized by ABEVA, the Belgian Association of Asbestos Victims. Erik Jonckheere, ABEVA's Co-chairman, condemned the government which still refuses to recognize the plight of the asbestos injured. inward links: any links to this site should be clearly marked as such and the IBAS site must be displayed full-screen without any "framing."